Do not forget your diving documents. Check the maintenance of your equipment. Inform the customs services that you are leaving aboard the ‘Equator’ with OK Maldives. If upon arrival you cannot find your guide, which is rare, but sometimes can happen, do not hesitate to contact your guide on site: (by phone): +960 777 3475. The guide will greet you at the airport after passport control and baggage collection. 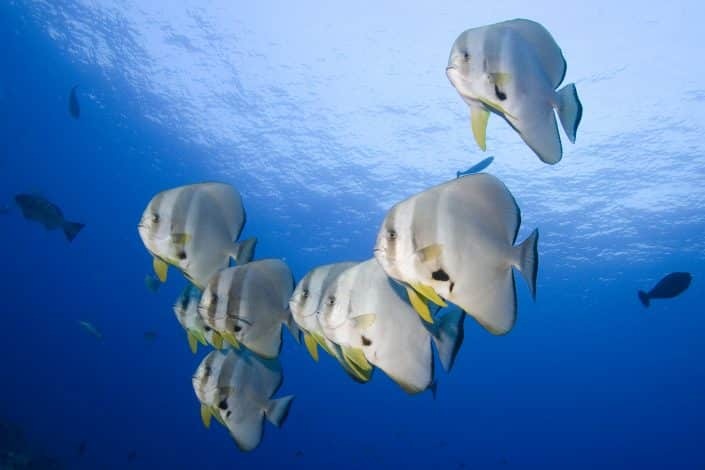 They will be waiting for you with an “OK Maldives” sign and you will board directly on our diving Dhoni. Your guide will then take care of the distribution of cabins (towels and bed sheets are provided) and will take note of the qualifications of the divers. You will do on the day of your arrival (except in the case of a late arrival) a “refresh” dive accompanied by your guide. OK Maldives makes every effort to optimize your stay as soon as you arrive: : no spending the night in the lagoon of Hulumalé unless there is a flight delay. 13:00 – Lunch, choice of fish or meat, with vegetables and fresh fruit! 19:30-20:00 – Dinner, choice of fresh fish or meat, vegetables and fresh fruit! During your free time, you have a library with many books on the local underwater flora and fauna, as well as novels. The boat is also equipped with a CD player, a television and a DVD player. Otherwise, the sun deck awaits you for some sun bathing. During your cruise you will have the opportunity to visit local inhabited or deserted islands. Maldivians are welcoming and discreet people. Tourism is one of their main resources. You do not need permission to shoot or film, as long as you do it with a smile . No worries with regards to safety, despite what you’ve heard in Europe. The Maldives are a perfectly safe destination and the Maldivians are charming people. Tipping is customary in the Maldives. €10 per day and per passenger is recommended according to your satisfaction (tips are then distributed to the entire Maldivian crew). Upon return, your guides will ensure that you have time to shower before reaching the airport at least two hours before take-off. For late departures, dinner will be served aboard the boat. We personally bring you back to the airport: we are here to take care of you from your arrival until your departure. 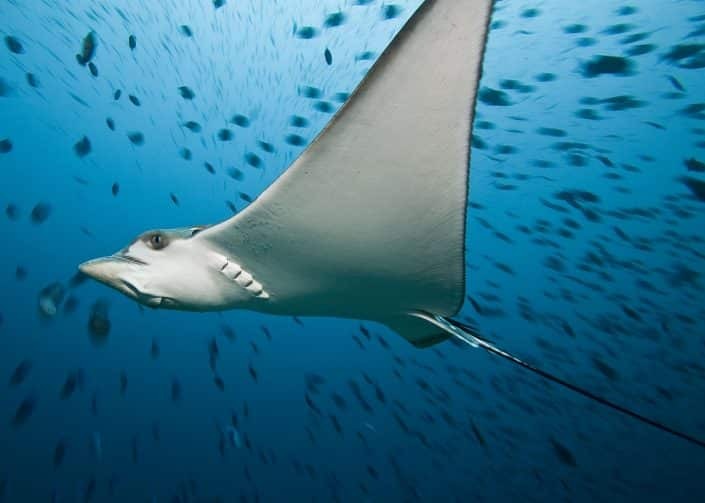 OK Maldives offers you different itineraries, all of which are high quality diving tours, both in terms of the abundance of exquisite life found in the Maldives, and for the knowledge of our guides. The diving is entirely organized by professionals, BEES 1 or BEES 2, and PADI Instructors. For each dive, a detailed briefing of the site, the organization of the dive as well as some security reminders will be delivered. All dives are accompanied and guided if you wish. A surface surveillance is always in place, because of the possibility of strong currents that we may come across. The diving is done at a rate of 2 to 3 dives per day. The diving will be organized according to the qualifications and experience present. The average depth of the diving is around 30 meters. Most dives are done with safety stops. The Maldives is the paradise of the “big”, but also the small .. and the average! 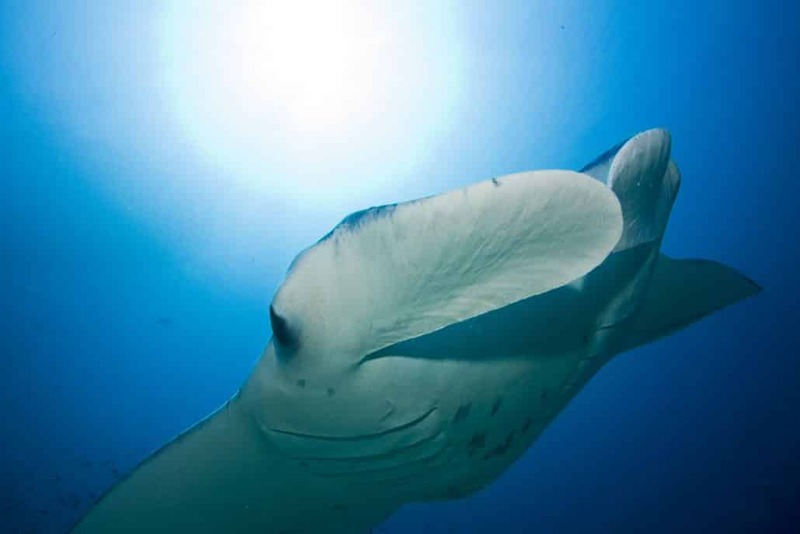 Reef manta rays or oceanic, green or nested turtles, reef or pelagic sharks, dolphins, tuna …. impossible to list everything you can look forward to seeing. To give you a taste here is the list of the different species of shark observed by the OK Maldives team and its customers in 2017: whale shark, big hammer, hallicorne hammer, tiger, silky, fox, bulldog, big-guitar, grey, albimarginatus, leopard, sleeper, black tip, white tip! 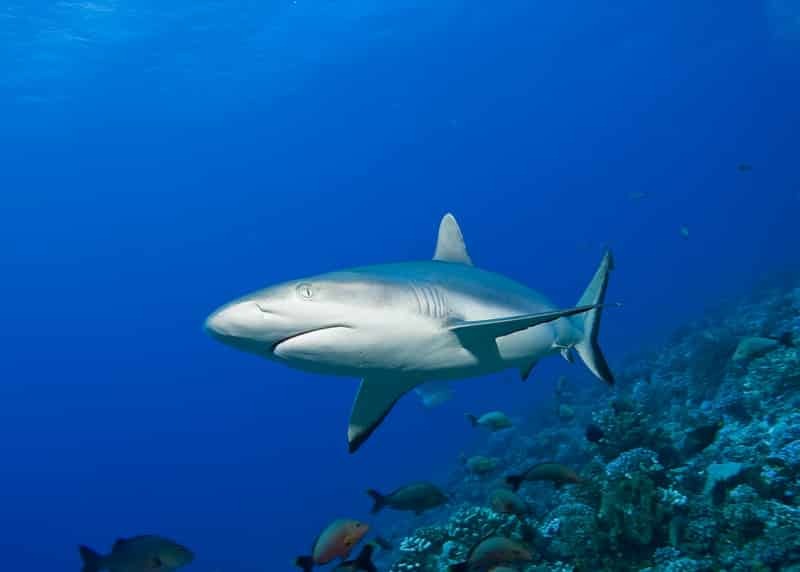 All our cruises are accessible to you, with the rhythm of 2 to 3 snorkelling sessions per day depending on the Atolls. The Maldives are accessible to all, from beginner to advanced, why deprive yourself? 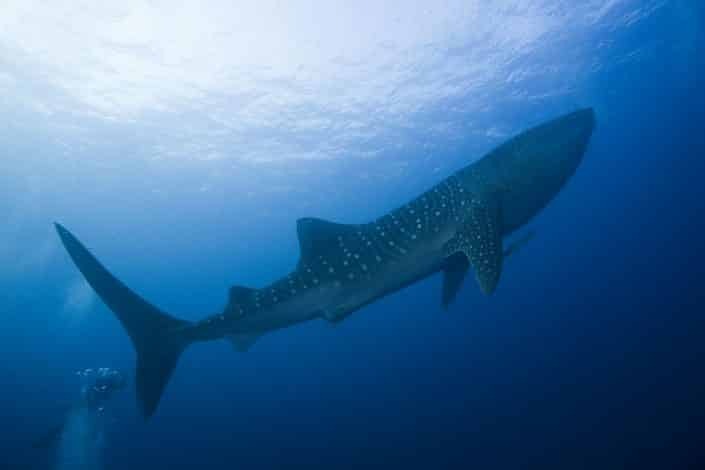 We will offer trips in the dive Dhoni, with divers. If the sites are less suitable, we will put at your disposal the annex of the boat to take you to the reefs, where you can meet the same species as the divers. We can also organize special snorkelling sessions upon request. Gift: a free try dive is offered to each “snorkeler”. Diving in the Maldives takes place in warm water with good visibility. However, the current can sometimes be strong. A good physical condition and a technical level equivalent to CMAS 2* are recommended. 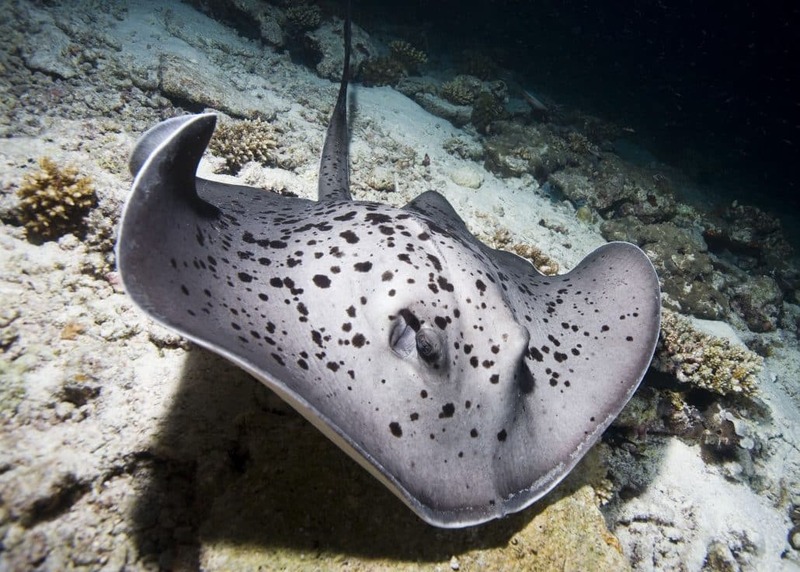 As OK Maldives will offer you for each dive to be accompanied by at least 2 professional guides, we can adjust the level of the dive for the “more recently qualified”, without reducing the quality of diving for the more experienced divers. Always looking to modernize its operation, OK Maldives became an Aqualung partner in June of 2017: our company now supplies equipment of a world renowned quality. OK Maldives uses reliable equipment of a high quality. The five Dhoni is equipped with 3 compressors, including 1 Nitrox, 30 dive cylinders, steel or aluminium (DIN or INT), weights, storage cases for diving equipment, and hangers for your suits. Aboard the Dhoni you will find all the necessary safety equipment: pure 02 B50 Cylinder, oxygen therapy equipment, first aid kit, a fully equipped back up diving tank set up, etc. the dive tank and weights will be provided, as well as diving hooks to use in a current. Three 15L steel tanks are available to heavy consumers, with agreement from the guide and according to their acknowledgement. At least one night dive is planned during your stay, think of your lighting for this. Possibility of rental equipment: BCD – Regulator – Computer, etc etc, please be sure to notify us in advance. The rental equipment remains the responsibility of the diver in case of loss or damage. OK Maldives offers you the possibility of diving Nitrox (30%) on all your dives, if you are qualified (cost is specified in the quote). It is possible to get Nitrox qualified during your stay. Please note when you register your intention to dive Nitrox, so that we prepare and provide enough oxygen. Do you wish to use a rebreather in the Maldives? No problem, OK Maldives is the only French speaking cruiser who provides you with cylinders (2L or 3L) for your own rebreather. We supply the “Sofnolime” lime, as well as the O², and have a baby booster from Jetsam. Rebreather divers, do not hesitate any more, you are welcome here.